We stock a range of cat bowls and dishes made from stainless steel that are suitable for dry and wet food including pouches made by Classic that are easy to clean, hygienic, dishwasher safe, resistant to absorbing food odour, extremely durable and retain their sheen for many years. 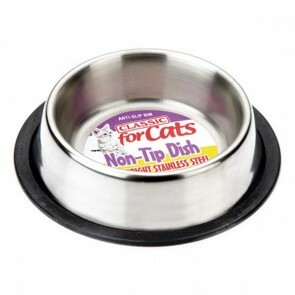 Also available are stainless steel shallow cat dishes and non tip cat bowls that have a removable anti slip rubber ring or fused rubber rim on the base to prevent the dish from moving on your floor, keeping the food and water safely inside them. We also sell traditional pottery cat bowls, dishes and saucers made by Mason & Cash that are heavier than metal bowls, making them harder to move around your kitchen floor, that are available in various sizes for food and water, are easy to clean, do not absorb food odours, are hard-wearing, hygienic and dishwasher safe! Bowls: 5 stars out of 5 based on 0 user reviews.